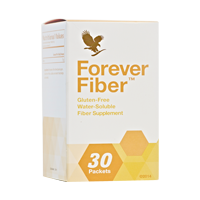 Mix one stickpack of Forever Fiber with water, Forever Aloe Vera Gel, or other beverage daily. For best results, pour contents of one packet into a glass, add your beverage of choice and mix thoroughly. You can also sprinkle on food. It is suggested to take Forever Fiber at least 30 minutes away from other dietary supplements as fibre may impact their absorption in the body.